Safe dog bones, best dog chew bones, healthy dog bones, best dog chew toy, best dog chew, safe dog bones for chewing, best dog bone, dog chew bones safe….oh my! Finding a safe dog chew. Most dogs love to chew! Chewing is a very natural and normal dog behavior. Chewing helps alleviate boredom, and can even help keep your dog’s teeth pearly white. But don’t forget to brush your dog’s teeth too. Puppies and adolescent dogs tend to have a high drive for chewing things. Hopefully, you are working with a qualified dog behavior counselor to make sure that you are teaching your dog to chew on the right items, instead of your furniture, or even worse, electrical cords, or something else that can harm your dog. So just what makes a dog chew or dog chew toy safe for your dog? Well over the years my opinion on this has actually been evolving from hard, to chew bones, to now a softer variety. You see, I have been learning from seeing too many dogs with chipped teeth from tough bones and antlers, and even digesting sharp pieces of bones which can be very dangerous. I no longer use hard bones or antlers with Dexter The Dog, and usually don’t recommend them. By the way, if you look closely at Dexter’s teeth you will see a chipped tooth….from a hard bone. His last. Below are some examples of dog chew items that are much softer for your dog’s teeth than traditional hard bones. This will help protect your dog from chipped teeth. Please be aware that not every chew toy or chew bone will be suitable for every dog. I strongly recommend active supervising when your dog chews, particularly if it’s a new toy or bone or if the chew item is edible. The right size of a dog bone or dog toy is important too. You want to make sure the dog toy or dog bone is not so small that your dog can place the entire item in his mouth and risk choking. This includes when the chew gets smaller. I tend to toss the end out before Dexter The Dog swallows it, with the exception of dehydrated fish skins. The larger a dog toy, the thicker and tougher it tends to be, something to consider if you have a dog who is a hard chewer. BUT be aware, sometimes if the toy or bone is too big, it can get stuck in your dog’s jaws. Finding the right chew for your dog is sort of like the Princess and the Pea. Soft or tough rubber chew toys: I am a fan of Kong and have been for many years. Kong has been the leader in stuffable dog chew toys. I also like The Rita and Jed stuffable dog toys. The key to getting your dog to chew on a rubber dog toy is to stuff it! If your dog is eating the rubber vs the inside food, I do not recommend. Read our article on how to stuff a hollow dog toy. 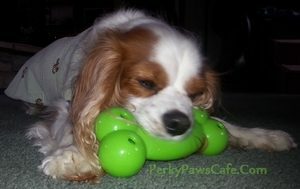 Check out our latest stuffable dog toy reviews here. Dehydrated fish skins: With a good dehydrated fish skin dog treat, the treat will be 100% fish skin with no artificial colors, preservatives, or flavors. Read my reviews on dehydrated fish skins. It’s important to check out the packaging and carefully read the ingredient list and where the fish was caught and processed. A fish skin is a great treat for your dog, full of omega 3 fatty acids, typically low fat, and fully edible. Most dogs love the taste and eagerly chew away. Bully Sticks: Made from the manly part of a bull, a lot of dogs love chewing on these. What I like is that they typically just start to get soft and disappear, I haven’t seen any pieces break off. However, I have seen a stick every once in a while peel during chewing like string cheese. I just toss that piece in the garbage. Again, when the stick gets too small, I throw it away. Tip: get odor free, or low odor. These babies can stink like crazy! High in protein and fiber and low in fat, these make a nice chew. Look for my reviews on bully sticks. 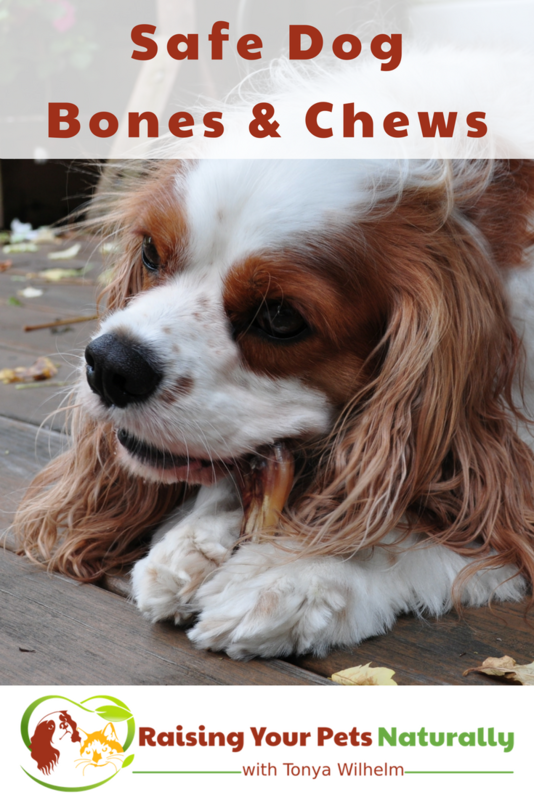 Raw bones: Raw bones are another option for your dog to chew on. Because the bones are not cooked, they are soft and unlikely to splinter. Cooked bones easily splinter and are very hard on teeth. I will be testing raw bones for the first time in the upcoming weeks. I spoke in length with holistic veterinarian Dr. Judy Morgan on the safest way to go about this. Dr. Morgan’s tips: “Don’t clean the bones, feed them with some meat on them, as they come. Let them pull on the meat and sinew and lick out the marrow. I just allow them to have them for an hour, then throw them away. It’s when they sit around the house, get buried, or get dried out that you get bacteria and splintering. They will last in the fridge a week before feeding. Can also be frozen and thawed.” I have to admit, when I try our upcoming raw bones, I think I’ll have Dexter chew on them on a towel and toss the towel in the wash. Read my raw bone reviews. Nylon, rubber type bones and chew: If you have been following me, you may know I’m a bit leery now on what exactly I give Dexter to chew and play with. I think this is doubly important when we are talking about a product that will be chewed and possibly have pieces ingested. I do not recommend these products. So there you have it. That is the current list of dog chew and chew bones I feel comfortable providing Dexter and recommending to my dog training clients. I am sure this list will be updated and maybe I can try some other chews and feel confident in using them. 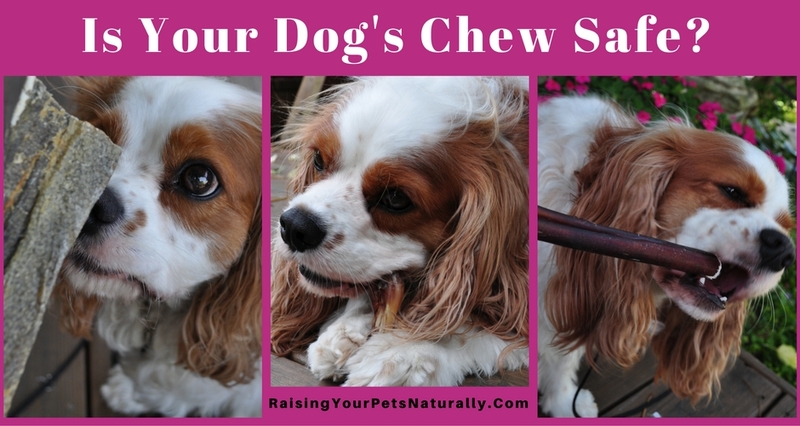 Does your dog enjoy a good chew? Tell me in the comments. My Cavaliers like the VET dental sticks and chews. What do you think of those? I don’t like any rawhides. The first reason is they are a huge choking hazard. Dogs bite pieces off, then as they digest, they swell up. Second, usually the quality of the hide is horrible. Then, as with everything, flip over and look for an ingredient panel. I *think* this is from your product. –> Solution of Chlorhexidine Gluconate, Beefhide, Maltodextrin, Hydrolyzed Poultry Liver (Enzymatic), Tetrasodium Pyrophosphate, Salt, Lecithin, Sodium Gluconate, Potassium Sorbate, Gluconodeltalactone, Mineral Oil, Mixed Tocopherols, Rosemary Extract. I never want potassium sorbate. Huge migraine trigger for myself, so that tells me no, no. You can also plug in some of the ingredients here for side effects or type in the ingredient and side effect to learn more about something. https://www.ewg.org I go for simple, products, without questionable ingredients. But, that’s me.